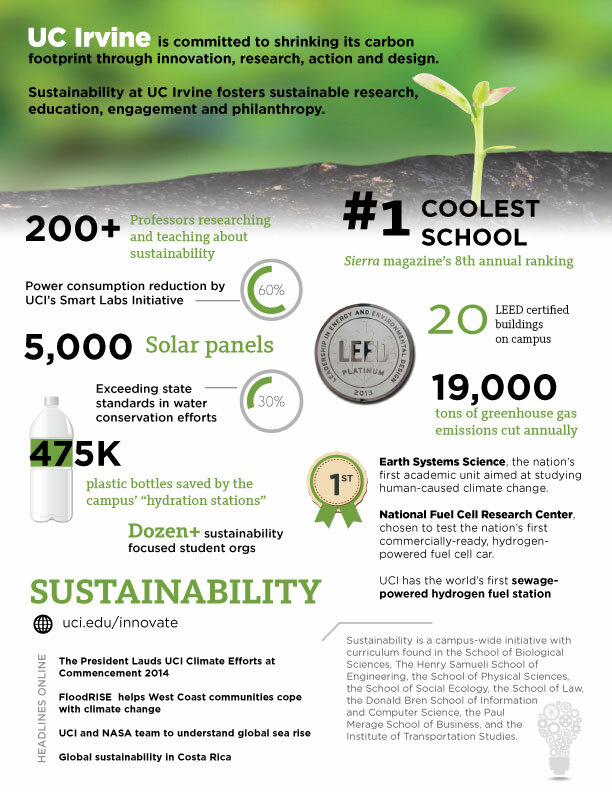 UC Irvine is committed to shrinking its carbon footprint through innovation, research, action and design. Sustainability at UC Irvine fosters sustainable research, education, engagement and philanthropy. Earth Systems Science, the nation's first academic unit aimed at studying human-caused climate change. National Fuel Cell Research Center, chosen to test the nation's first commercially-ready hydrogen-powered fuel cell car. Sustainability is a campus-wide initiative with curriculum found in the School of Biological Sciences, The Henry Samueli School of Engineering, the School of Physical Sciences, the School of Social Ecology, the School of Law, the Donald Bren School of Information and Computer Science, the Paul Merage School of Business, and the Institute of Transportation Studies. UCI maintains an online directory of faculty available as experts.